It’s better late than never when it comes to Spain’s final municipal inauguration of Mayor. At noon on Friday, after the swearing in of the entire local, democratically elected councillors, Eduardo Dolon was sworn in as Torrevieja’s Mayor for the next four years. He took over the role from retiring Mayor Pedro Hernandez Mateo with professionalism and humility, bekoning fellow councillors not to stand and applaud but to show respect for the opposition and to act in a dignified manner. Dolon is a man of the people and for the all residents and visitors of Torrevieja. 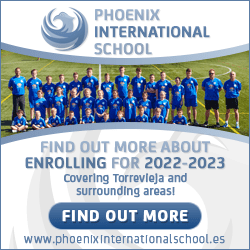 He has produced possibly the most ambitious political manifesto that Torrevieja has ever seen and stated his desire to work with the opposition parties to try and ensure that the needs of all citizens of the city are recognised. The traditional and legally binding event took place the municipal council chambers of Torrevieja, in a completely packed plenary hall, which, with the windows closed, was far too hot for many, who had to leave to obtain some air! There were also letters and words of congratulations from the president of the Valencian Parliament, Juan Cotino, former mayor, Pedro Hernandez Mateo, the PP regional deputy Andres Ballester, national PSOE deputy Carlos Gonzalez, the former mayor Joaquín García , Deputy Secretary of organization of CPAP, David Serra and the mayor of Almoradi, Antonio Ángel Hurtado. Dolon also said a few words about popular former councillor Pedro Valero, who is recovering from a Heart Attack suffered last Thursday and wished him a speedy recovery. 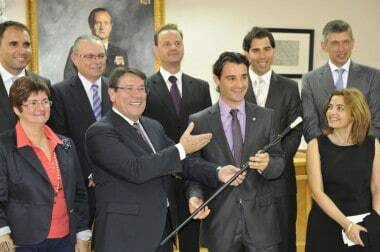 He reached out to all citizens of Torrevieja from the outset saying “the doors are open in my office,” and he offered the opposition parties “an outstretched hand, just to work for the good of the citizens.” Eduardo Dolon received congratulations from the leaders of the PSOE, Angel Saez, APTCe, Domingo Soler, and the Greens, José Manuel Dolon, the rest of council, their families and a large number of attendees. 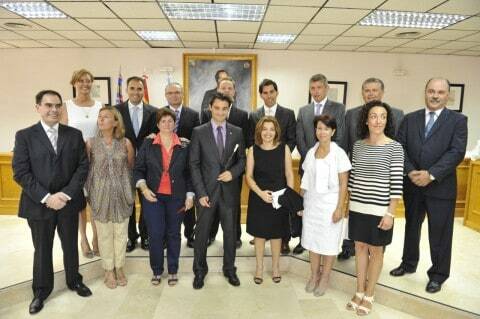 So until 2015, your mayor in Torrevieja, is Eduardo Dolon Sanchez.